Some say Indexes and some say Indices. What are they, and why the different words? Having worked with indexes and indices for most of my adult life, I thought I’d use this blog to share some thoughts about the purposes of indices, or indexes. Yes, the names mean the same thing, both being legitimate plurals of the word ‘index’. But some organisations prefer using one over the other. The word ‘index’ has many uses, from the list of topics at the end of a reference book, the name of a finger and the little number used to denote the power to which another number is raised, to what we are concerned with here. And that is a time series of dimensionless values depicting the relative magnitude of something being measured. More specifically, this article deals with market indices, which measure the relative value of a basket of assets which in turn have been chosen to represent some or all opportunities in a market. For an index to be relevant, its movements have to be replicable, in theory at least, through the purchase of those assets in specified proportions. For example the retail price index (RPI) measures the rise and fall of a basket of consumer goods and services which can actually be bought. Not all indices are replicable, though. Famously, the FT30 measured the movement of thirty of the largest UK companies. But it did so using an equation which was not replicable, and the index fell into disuse soon after the FTSE 100 was launched in the UK in 1984. Allegedly, the FT30 is still being calculated. Some indices are harder to replicate, such as the various house prices indices. These seek to put a value on the housing market using house prices. But, of course, most houses aren’t changing hands, so the index serves at best as an indication of house price movements. Stock market indices, and more recently bond market indices, have become hugely popular in recent decades. Some organisations compute tens of thousands of them. The most successful are those used as the basis of investment products. What started as benchmarks against which investment managers are assesses have become investments themselves. 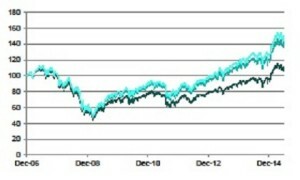 The growth of Exchange Traded Funds (ETFs) in particular have redefined the index space, with indexes being constructed for the sole purpose of launching ETFs. What does an index tell me? Usually a news broadcast finishes with a financial roundup which includes running through the changes in a small number of indices. Nearly always these changes are over a 24 hour period, with perhaps some comments about how an index rose or fell following a piece of news during the day. It’s hard to know what it really means when we hear that the FTSE 100 is up 10.6 points to 6896.4. It’s tempting to think that it means it’s been a good day in the UK. But looking deeper, we start to see that 10.6 points is not much in the context of a final value of 6896.4. And when we realise that the index is dominated by a small number of companies, none of which derive the majority of their revenues from the UK, then we might start to question the relevance of the index to our daily life or even the UK economy. If we have large investments in stocks quoted on the London Stock Exchange, then the FTSE 100 is going to be much more relevant, however. It’s not just the UK,though. Almost all well-known indices are calculated as weighted averages, with the market values of the constituent companies defining the weightings. The USA is perhaps a little kinder than most, because its largest company, Apple, is only 3.5% of its popular S&P 500 index. Interestingly, another index, the Dow Jones Industrial Average (or Dow Jones 30) is also widely used in the USA even though its calculation uses stock prices as weights, regardless of the sizes of the companies. The company with the largest weight in the Dow is Goldman Sachs at around 8%. While the USA might not have the same degree of dominance by a small number of companies as the UK, other markets have extreme tilts. In Switzerland, much of the market consists of shares of three companies. And in Belgium, the largest company’s market value is around half of the Belgian market, although its BEL20 Index caps all constituents at 15% weight. So when someone tells you how much an index has moved, you might want to try and sound impressed, but be curious and ask them what that really means. Originally, indexes were created to measure the rise and fall of a stock market. Then investment managers found that their performance was being compared to an index, and they came under much criticism if they under-performed. This resulted in a more cautious approach, where investment managers would ensure that their investment portfolios wouldn’t be allowed to deviate too much from the index to which they are being compared. An unwanted corollary of this was that if an investment manager believed that a particular large company was not an attractive investment, they would nevertheless buy shares in it but only to the extent that it would have a lower weight in their portfolio than it has in the index. They would consider it risky to have no shares in the company at all, just in case they were wrong in their assessment and the company actually did rather well. Not a problem if the company is 0.1% of the index but a much bigger problem when it’s 10% of the index. One example of how this played out was when BP’s share price plummeted following the Deepwater Horizon disaster in 2010. Many UK funds were affected by this because BP, being among the largest of the UK companies at the time, was held by them. The fact that BP’s presence in a UK portfolio is questionable anyway, much of its revenue coming from elsewhere in the world, was lost on many. Indexes can mislead as well as guide investments. With many studies questioning how much value an active manager can add to a investment over and above an index, there has been a slow but sure move towards index-based investments which has accelerated in the last ten years or so. Probably the biggest shake-up came when Research Affiliates introduced the concept of fundamentally weighted indexes. Rather than the stock market value of a company defining its weight, we now saw the weight calculated using quantities found on company reports, such as total revenue, book value and earnings. The FTSE RAFI have been a huge success, and other organisations have come up with similar ideas, such as HSBC’s HESI Indices. Now often known as “Smart Beta” indexes, the idea of using alternative weightings has seen all kinds of variations. Another popular idea is an index consisting of only those companies with share prices which exhibit low volatility, such as Euromoney’s EMIX Europe Low Volatility Index. The idea here is to give comparable returns to that of a broader index, but with lower volatility (daily fluctuations). I have been using the two words interchangeably. There is part of me that wants to explain the difference. After all in the UK we use the word ‘programme’ rather than the US English ‘program’ except when we are talking about computer code. Is there something about indexes that differs from indices? No, not really. Although it is tempting to think that the more sophisticated products are ‘indexes’ and the more traditional products are ‘indices’. In practice, it is the owner of the index that decides. So for now we have FTSE Indices and Euromoney Indices. But we have MSCI Indexes and S&P Dow Jones Indexes. I work for Euromoney Indices but everything in this article is my personal opinion and not necessarily the opinion of Euromoney Indices.